→ Standing at 5 foot 5 and90 lbs, he wears tight leather clothing. He bears a single sword he uses. Under his tight leather coat that falls to beneath his knees, are elaborate tattoos almost like a tribal tattoo. This, however, is false, it is, in fact, an alchemy circle. He has soft yet prominent crimson eyes. His leather clothes have a stitch like pattern on various parts of his clothes. 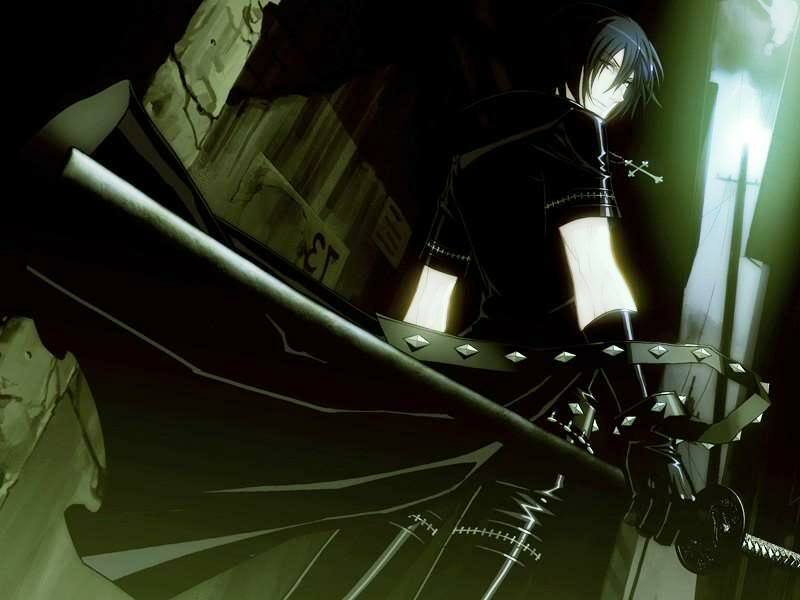 he wears leather gloves that span the whole of his forearm and on his right hand, a studded(with spikes) band of leather tied to his wrist. Usually clenched in his hand is his black Katana. He wears tight leather combat boots with steel outlining it making it heavy duty. The coat's sleeves only go to just above his elbows. He has his hair cut to sort of frame his face in a dutiful way as well as regal like. His belt is studded with spikes and has a buckle that shines in the right light with a cross engraved inside it. On his neck, he has a cross with the same shape and form of his belt buckle. Just above that cross he has another plain cross around his neck. On his left wrist there is a tight and thick silver band of metal. → Sonai can be gentle at times. At other times he could be stern when he has to. He is one of the most kind people you would ever meet, however, he can also be the most harsh person ever. He finds himself with the thought of "how can I avoid a war?" and the thought of "how can i bring peace and harmony to my land?" He is one who would rather sit down and have tea with you, instead of fighting to the death. He has always loved all creatures but always found that there was something off about the Alchemy that Amestris used. He was very talented in Alchemy himself for a while..that was..until his father died. When that happened, he was forced to take the role of King.. but he humbled himself by keeping the title Prince. He finds his subjects to be the one thing that keeps him going. Why you ask? well it's simple, He would be nothing with out his subjects. That's his reasoning. He often finds himself thinking of how people can be used for the greater good instead of how people can be used for battle. Because of his age, he has a lot of time to learn what needs to be learned, however, despite his age, he is more wise than he lets on. At times he can even be comical. This is shown by many things. Like, how he just get's drunk off the smell of Alcohol. This is one of the more comedic parts of his life. When it comes to outsiders, he sees them as more of creatures to be loved, however, he still finds an off feeling of Amestris. With his feelings of peace, he tends to neglect the finer points of war, or so it seems. He loves to play the fool as it were. Even though he's a Price, he still is only 17, and with that, he keeps the nature of a 17 year old boy at heart. He is also Madly in love with his wife. She is the Princess of Xing and also Xingeese born. He was never fond of the Arranged marriage but, after he saw her, he fell in love. → In his early years he was free to experiment with his life as a child should. With that, he experimented with Amestis alchemy and found it to be, off. So, he experimented with an Ancient book he found in the royal library. It was filled with writing from what seemed another age. For years he tried to decipher it. Finally, he did. It took him three years to decipher, and another three years to learn all that was in the book. But the kicker, was that it took him 2 years to master the application of only the first page. The book was his life. Even with his arranged marriage at the age of 2, he still set out to learn everything in the book, and to master it. And it was at the age of 17 that he mastered the book, but at what cost? He mastered the teachings of this fantastic book of ancient alchemy, and what was his cost? His father had died just moments after he proclaimed to his father that he had done what his father wanted, and stuck to something he loved and had a passion for. It was sad indeed, but still, he would take the crown of his forefathers with him as never again would there be a king. This was because Sonai thought, "A king was my father, I am but a lonely prince in comparison." Indeed was it a dark time for Xing. The loss of their greatest king and the new ruler only just barely of age to take leadership, kept to being the Prince. The attempts on his life make him stronger even if some of them were close calls. Through his life however, he met several people. These people changed his views on life and the people in it. At the start, he found life to be a pleasure. He found it to be the best thing in all of the universe. Then, when his father was struck ill, he felt that life was the crappiest thing to give someone. He felt like it was a cheat and nothing good came from it. Then a woman met with him. After their fateful meeting, he became re in-tuned to the finer points of life. He was less distraught with his father's passing and looked towards the peace and harmony aspect of life. When he encountered this woman he remembered his dearly beloved and how much he loved her. It was that, which he found to be the true anchor to his life. In the final days of his 16th year, before his father was struck ill, he had fought with his father. The fight lasted until he was struck ill. The reason was that he rarely got the umph to finish anything he started. It caused his father to grow weary of his ability to do anything. But he proved himself on his father's deathbed, which made his father's last moments his proudest, and happiest. → First and foremost, the Ancient book told of an art not directly called Alchemy. It was instead called the Ancient art of Lebis, The Grand Arcanum. In his studies he learned the process of modern alchemy by the roots. He had to learn all three steps one by one. For Sonai, he has mastered the first two of the three steps.This allows him to do things not normally done by Alchemists. His alchemy is not based in any one direction. However, it is based in multiple directions. A little of this and that, simple of everything to be more broad. His alchemy circle is in fact his whole body it's self. During the stages of his power he gains several things..
To start, he has only control over the first two steps at least. And limited of the third. He can't create anything big. To the biggest he can create, and most famous made by Doc, is a small golem. It's head twice the size of its body. Its height is only a max of 3 feet tall. And he is limited to creating one. For the rest of his power, he can only change the shape of his sword and small objects like that. → with all of his training in the alchemical arts. he has also formed a sort of Armstrong feel to himself. He has conditioned himself to be able to keep his body from feeling the pain. Also with this conditioning, broken bones mean nothing to him. All through his body is implanted metal "veins" that allow him to move, much like automail. → Fujai wears an older looking samurai armor. The reason for this, is because it's specially made in order to resist the erosion of water. 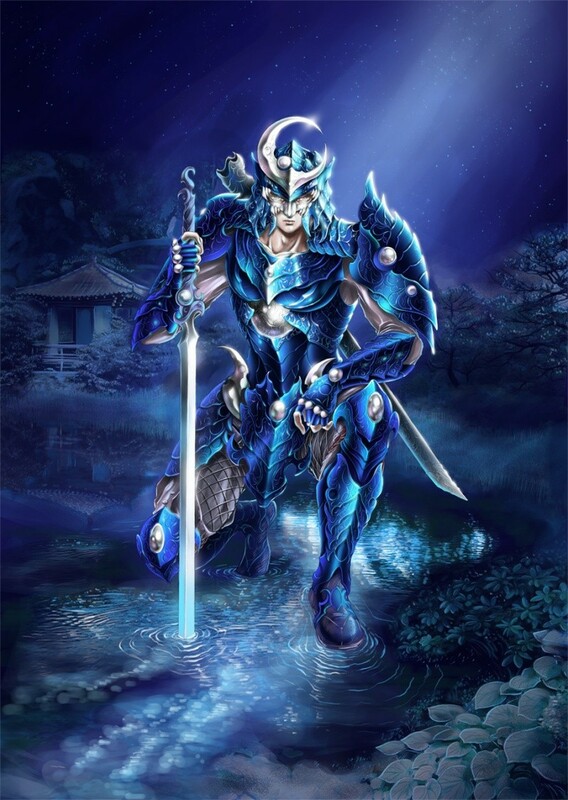 His armor is a beautiful blue that shimmers like water does in the perfect light. He carries a sword about six feet long of the blade it's self. Then, it has another three feet for the tsuka. His armor is set up like dragon scales or a fish of sorts. On the forehead of his helm he has a crescent moon shaped object. He has soft white skin and barely speaks to many. He has a strong military voice. His educate is more of a noble but his fighting style is that of a madman. He has soft blue eyes that can almost penetrate one's soul when he stares straight at you. He is athletic and shows it when he fights at times. under his armor he is ripped, yet still rather skinny. His blade glows a somewhat bright cyan when it touches water or conducts it's alchemy. This is reflected in his eyes. He has metal integrated in his suit that helps him move if a bone breaks. The metal reacts to the water inside which he can control with his alchemy. → Fujai is a man of many talents. This is further shown by his persona. He has two types of personae he goes through. First, he has the outside persona. He is kind and caring of all animals and people. He would try to save a damsel in distress and even risk his life to save his comrades. He drinks tea and keeps an almost regal appearance. This is made evident by his voice for the first part. On the flip side, he is the most psychotic maniac you will ever encounter. He will keep fighting until your either dead or wounded beyond fighting. He will drink your blood and even drown you with his water abilities if given the chance. He is the mot psychotic person you've ever met. With that said, you can guess that he's pretty hot headed too. That would be correct. But, not as much as one would think...instead, he finds that he loves to taunt the opponent in order to get them to mess up, this is because if a person gets flustered or angry, they mess up easier and don't' think as much. This was shown when he fought his sensei and won. His other love of his life is his sword. It's sort of a wife to him, however, if it breaks, he will get a new one with out fretting. His personae revolve around his ability more or less. The more water there is, the more he gets confident and such. In this stage he would only sacrifice his life to protect himself or someone close to him. He fought long and hard to get where he is, and at this stage, he would fight to keep it no matter what. Even with this however, he finds that there is still a part of him that will at least think about saving a damsel in distress. → It all started on a cold day. A little boy was born on the way to Fort Briggs. He was raised in the North and nearly all in Briggs. Though, that wasn't technically aloud, he was kept in a small hut just a few miles away from Briggs.